AF Symposium (AFS2017) is the first cardiovascular medical conference of the year. It is a three day symposium with the world’s leading medical scientists to share and discuss atrial fibrillation (Afib). After 18 years in Boston, it moved to Orlando, FL in 2014. This is my second year of attendance. This will be the highlights of each day’s presentations taken from my Twitter feed (@DebbeMcCall). This is a topic many Afib patients have discussed. How much physiological stress plays into Afib. Afib-associated hemodynamic (pumping of the heart and blood) stress promotes ROS (reactive oxygen species), or the body’s response to additional stress from obesity, diabetes, sleep apnea, high blood pressure and specific heart changes like enlargement, fibrosis (stiffening), failure, or extra heart beats. This results in inflammatory substances (cytokines) that promote more inflammation, impairs the heart from healing itself, and increases the heart’s susceptibility to Afib. Per Dr. Van Wagoner, development of treatments that are more effective in treating oxidative stress and inflammation may help treat or prevent Afib. The association between obesity and cardiovascular disease is well established. More than one third of the adult population in the US is classified as obese, an observation that is expected to affect the number of Afib patients. Obesity is associated with more episodes, longer episodes, and fibrosis (stiffening). Epicardial fat volume (fat around the heart) is highly associated with paroxysmal (part-time) and persistent (full-time) Afib, independent of the traditional risk factors like high blood pressure, diabetes, sleep apnea, etc. The more epicardial fat = longer duration of Afib episodes. AF Genetics and Genome Sequencing in 2017: What Have We Learned? Can we use genetics to identify the pathways and potential therapeutic targets causing Afib? As you can see above, Dr. Ellinor’s research group’s approach is to gather large scale genetic data à looking for AFib mechanism and functional genomics (making use of the large batches of data from genes) à improve treatment for Afib. The AFGen Consortium (AFGen.org) is a global Afib network to use genetic approaches to find causes for Afib and, ideally, lead to new treatments. By 2017, this consortium has published 29 studies, with 18,000 Afib cases and 24 genetic loci (specific points on a gene) for Afib. By working with three other large data gathering groups and studies, they have published 53 studies, with 60,000 Afib patients and over 100 Afib loci. Afib genetic risk scores can identify those at the highest risk of stroke and that may be a subclinical (no symptoms yet) maker of stroke. Wouldn’t it be wonderful if a stroke wasn’t the first sign of Afib for some of us? The next challenge is a better understanding of each gene and its pathway. In the long run, genetics has the potential to provide a window into new treatments for Afib. Let’s face it. We get screened for many diseases. Why not Afib? 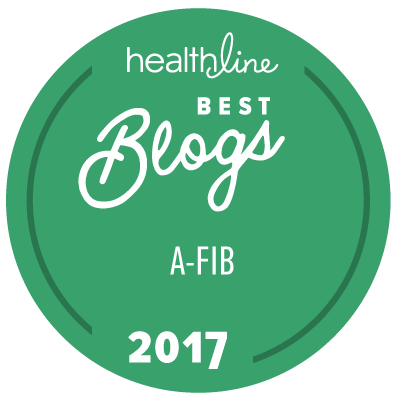 Ideally, documenting and diagnosing Afib could mean fewer strokes and early, more effective treatment. It’s not a simple answer. The only valid justification for screening is that health rewards outweigh the health harms and are worth the dollar costs. Unlike some diseases, Afib doesn’t occur as often as high blood pressure or some cancers. We would need to screen many to find a few. How to screen is also a question. Taking a full minute pulse by palpation (touching, like a wrist pulse) or listening with stethoscope is low cost and easy. Teaching patients to do this at home may be useful as well as in clinic. Devices, such as the AliveCor, show positive benefit, especially for paroxysmal (part-time) Afib patients. There is cost associated with the device and it won’t catch those with who are asymptomatic (no symptoms). Screening programs have a variable cost but may cost staff and clinic time to document a few. There are more questions with cardiac or implantable monitors: cost, monitoring, and data storage. The harms from screening are small. The big concerns are efficiency and the net benefit for an OAC (oral anticoagulant or blood thinner) when Afib is detected via a screen. Preferably, the target population would be those at high risk for Afib: over 70 years, multiple Afib risk factors, high CHA2DS2-VASc score, etc. Unfortunately, this won’t help a younger or healthier population. The goal of Afib screening is to prevent strokes and maximize OAC adherence (taking your blood thinner every day). Strokes are why we screen for Afib. Compared to other causes for stroke, Afib strokes have a poorer outcome and recovery. Fifteen million people worldwide have a stroke every year! As in Dr. Singer’s presentation, screening for Afib may reduce those stroke numbers. There are four methods to screen: systematic (everyone gets screened), community (everyone living in a specific area gets screened), high risk populations (those with risk factors for Afib), or opportunistic (right place, right time). There have been over a dozen trials across the globe to test different screening methods for Afib. Which is method is better? After reviewing the study data, there are two recommendations: Opportunistic, where a full minute pulse or ECG is done on every patient older than 65 during a clinic visit, and Systematic, where ECGs are considered for those older than 75 or those with a high stroke risk. Afib is a growing, global disease. With over 6 million Afib cases in the US and China along with 4 million in India, it continues grow. We also need to take into account how AFib-related strokes and costs impact countries with a lower reported incidence of Afib as well. A systematic review of 30 clinical trials and 122,571 global patients of all ages (not just those over a specific age) with a single ECG or pulse was conducted. Results from 8 of these studies showed that 18,189 Afib patients over 65 were previously undiagnosed and at high risk of stroke. Looking at a Swedish study, the conclusion was ‘the longer you screened, the more Afib was detected.’ We still need to narrow who to screen and for how long. It may also help with other health issues such as heart attack, heart failure, dementia, kidney disease, and clots. Device Detected AF: What is the Stroke Risk and When Should Anticoagulants Be Used? Why isn’t stroke risk equal to the clinical Afib burden? The true Afib burden may be 10x what a clinician sees in the office. Converting from Afib to NSR (normal sinus rhythm) may significantly increase risk. Afib episodes may permanently change the LAA (Left Atrial Appendage, where clots originate) or LA (Left Atria) as a long term risk for stroke. Afib of any time is a marker for a separate process that we don’t fully understand yet. Five studies on the risk of stroke after Afib were covered: TRENDS, ASSERT, VA-Carelink, IMPACT, and REACT. There is clear evidence that there is an ‘acute’ rise in stroke risk starting with the onset of Afib and tapering off after the end of an Afib event. Several studies show a residual risk of stroke for up to 30 days after the patient converted to normal rhythm. The exact relationship between Afib burden and strokes has not been defined. OACs (oral anticoagulants or blood thinners) following multi-hour Afib episodes for higher risk patients make sense. Whether the OAC can be stopped safely 30 days after normal rhythm needs to be further tested including the newer OACs. Documenting and diagnosing Afib earlier is better for patient and clinician. There are many tools now that can be used outside of clinic: Single Lead, Holter Monitoring, Mobile Telemetry Monitoring, and Implantable Loop Recorders. The goal is to determine is it Afib, and what is the pattern along with duration and burden of the episodes. Each has their pros and cons. With spot single-lead ECG devices like the AliveCor, it is up to the patient to recognize symptoms, record, and share with their clinician. Holter monitoring which can cover 1-2 weeks follows current guidelines but has a limited duration, especially for paroxysmal (part-time) Afib patients. Mobile telemetry monitors are costly, can be bulky, and are less studied. Finally, the ILR (implantable loop recorder) has no immediate feedback for the patient, is costly, and has connectivity requirements. Increased risk for stroke and clots based on the CHADS2 or CHA2DS2-VASc score and are recommended for OAC (oral anticoagulant or blood thinner) medication. The clinician believes the patient is suitable to take warfarin. Formal shared decision-making with an independent (not your EP) clinician, using an OAC decision tool and documented in the medical record. LAA occlusion can be safe and effective to prevent ischemic stroke and systemic embolism in selected at-risk patients.